Avant Window Navigator (AWN) is a Mac OS X like panel for the GNOME Desktop. In addition to launchers that can be dragged onto the bar, it features a taskbar that behaves similarly to the Mac OS X dock. The window navigator uses the composite extension for transparency and other effects. The latest version of Avant Window Navigator - as of this writing - is version 0.4. 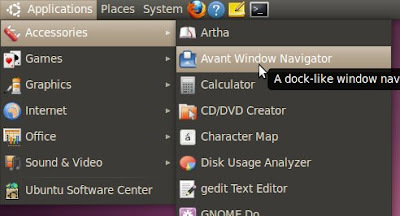 In Ubuntu Linux, it is very easy to install Avant Window Navigator (AWN). Open up Synaptic Package Manager from the Gnome System Menu and do a search for avant window navigator in its search bar. You will get a list of packages related to AWN. You should select the following packages to install. Synaptic will automatically pull in dependency packages needed to install AWN. Once installed, you can start Avant Window Navigator by navigating through "Applications > Accessories > Avant Window Navigator". Once you start Avant Window Navigator, it will display a Mac OS X style dock in the bottom center of your screen. Now I made a few changes to my GNOME desktop in Ubuntu Lucid Linux, to give it a better feel. 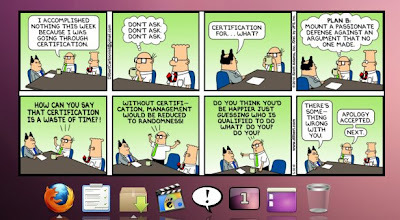 Delete the GNOME panel at the bottom of the screen. Right Click on the panel and from the pop-up menu press "Delete this panel". Open AWN "Dock preferences" dialog and make the following changes. In the Preferences tab, change Style option to "3D". Set Autohide mode to "Fade Out". Set the "Start AWN automatically" option. Setting this option starts Avant Window Navigator dock each time you log into your Ubuntu Linux desktop. See the following dialog box depicting the changes I made in my Avant Window Navigator dock settings. Note: To open the Dock preferences dialog, you should right-click on the AWN dock and from the pop-up menu click on "Dock preferences". You can run the following command from the terminal to open the AWN preferences dialog. 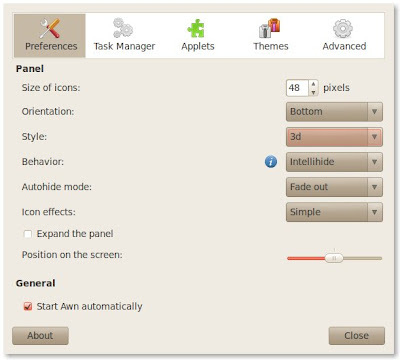 AWN comes with a good set of Applets which are really desktop widgets. There are desktop widgets for categories ranging from amusement, audio and video, calendar, clock, checking your email, personal information management, games, and many utilities. 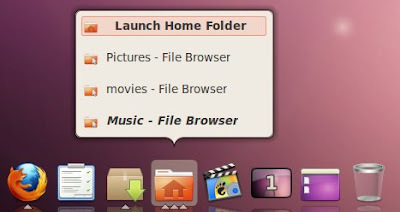 The following are a sample of AWN Widgets (Applets) I have installed on my Ubuntu Linux Desktop. To know the name of each awn widget, hover your mouse pointer on each image. There are lots more AWN widgets available in the Avant Window Navigator Preferences dialog. Here is a cool YouTube video which showcases the Avant Window Navigator in all its glory, running on Linux Mint Distribution. To learn more about Avant Window Navigator, visit its home page and also read the FAQ.